Audience Retention has been a much guarded secret at YouTube. I posted about it's importance on 11 May 2014 (don't go there now, wait till you've read this post, thanks - it will make more sense for you). For any video, the public can see a View Count and usually a Statistics area that outlines Time Watched, Subs Driven and Shares as Cumulative/Daily. 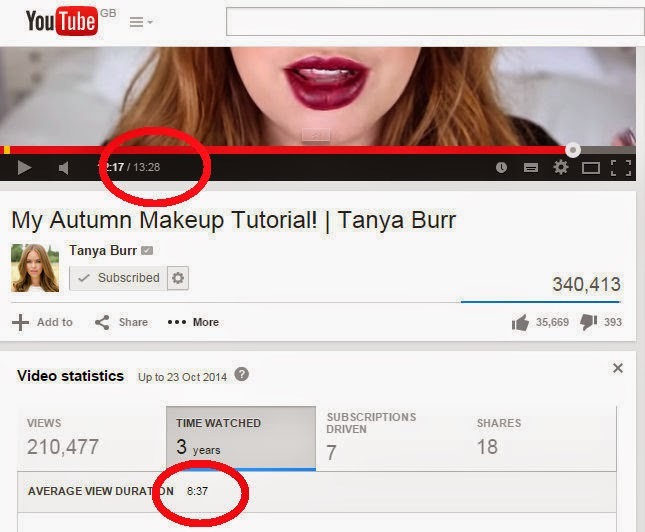 The key to finding Audience Retention is More > Statistics > Time Watched > Average View Duration and then some maths. This box will help you find posts from seven of my sites. To compare a search, I've made this example of googling, mike downes media audience retention, to perform this search below, just type 'audience retention' .. Feedback welcome .. Considering a blog column width - what's best on desktop? My blog has 932 posts (yes this one you are reading), with a column width of 580 and a sidebar of 280 (total 900 pixels wide with padding). 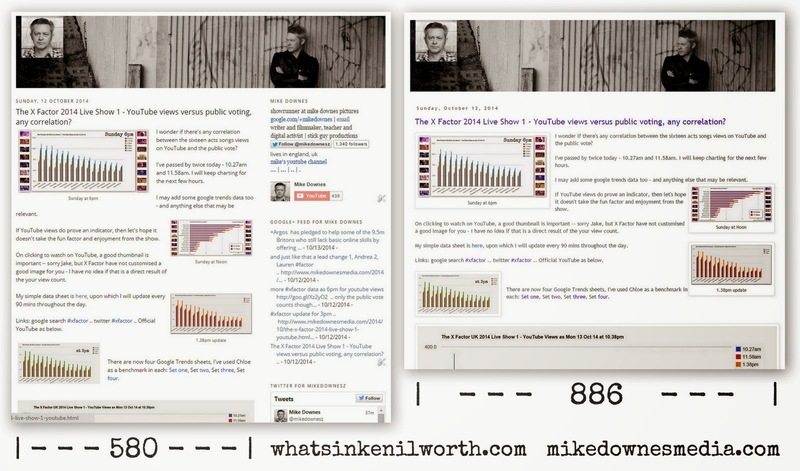 I have a second blog with a one column set at 886, no sidebar with only nine posts. The question I have for myself, and anyone who reads, is what reads best on desktop? For mobile, there is little difference. The X Factor 2014 Live Show 1 - YouTube views versus public voting, any correlation? 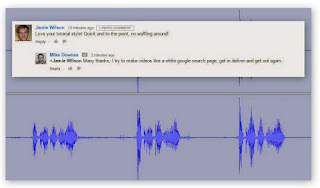 This article is a cross post from my widescreen blog: mikedownesmedia.com (this blog is 580 column width, where the other is 886 wide). I wonder if there's any correlation between the sixteen acts songs views on YouTube and the public vote? I've passed by twice today - 10.27am and 11.58am. I will keep charting for the next few hours. 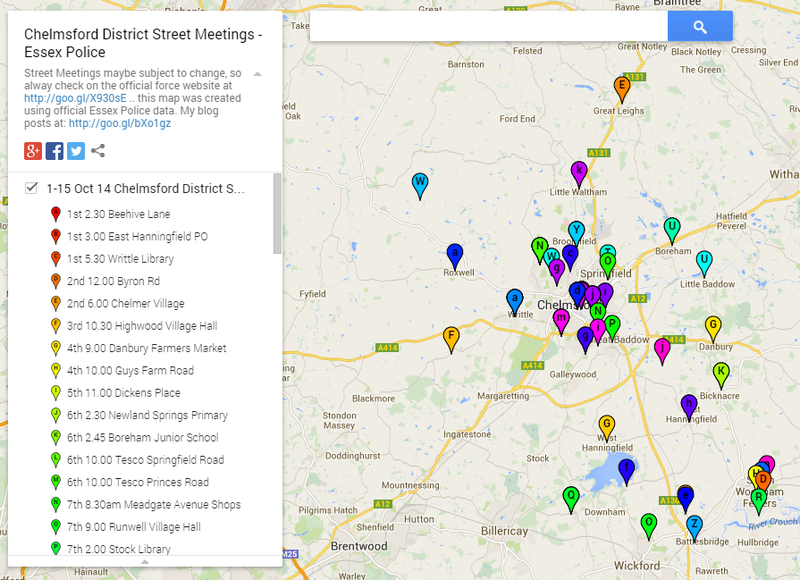 Sun 5 Oct update: The Chelmsford District Street Meetings Map is now available showing the 76 street meetings from 1 to 31 Oct. It's divided into two data sets, 1-15 Oct and 16-31 Oct, so as one timeline runs out, the next one begins. From the 76 meetings, there are 41 location post codes. With one location being used seven times in the month (another one has six).